Islamic Research Institute (IRI) of International Islamic University Islamabad (IIUI) has conferred an educational award on Senator Mushahid Hssain Syed in recognition of his Outstanding Academic Contributions in Muslim world. 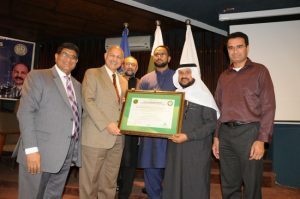 The award was conferred in a ceremony here on Friday at Faisal Masjid campus organized (IRI) of International Islamic University Islamabad (IIUI). 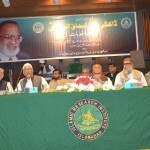 It was attended by IIUI President Dr. Ahmed Yousif Al-Draiweesh, IRI DG, Dr. Muhammad Zia-ul-Haq and other renowned personalities and IIUI’s high ups. Senator Mushahid, in his speech called upon Muslim societies to be united for the sake of dissemination of Islam’s message of peace. He stressed that educational institutions specially universities must play role in bringing the academia and governments closer and link both to find solutions of the hour. 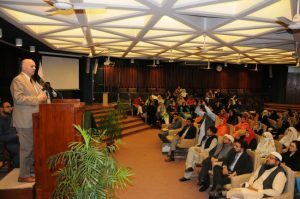 He hailed IIUI for its continuous efforts for tolerance, peace, stability and dissemination of moderation across the world. 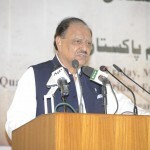 He also appreciated IIUI’s Paigham e Pakistan initiative. Senator Mushahid appreciated role of Dr. Ahmed Yousif Al Draiweesh for strengthening Pak-Saudi relations and said that International Islamic University Islamabad was on the way of development and progress under the present leadership. Prof. Dr. Ahmed Yousif Al Draiweesh, President of the university lauded the role of Senator Mushahid Hussain Syed for his efforts regarding harmony among Muslim Societies. Dr. Muhammad Zia-ul-Haq also felicitated Senator Mushahid for his efforts and vowed that IRI would keep working for providing solutions to the problems of the Muslim societies.